To review or not to review: that is the question. To discuss a game with AP potential or hope no one on planet earth notices! 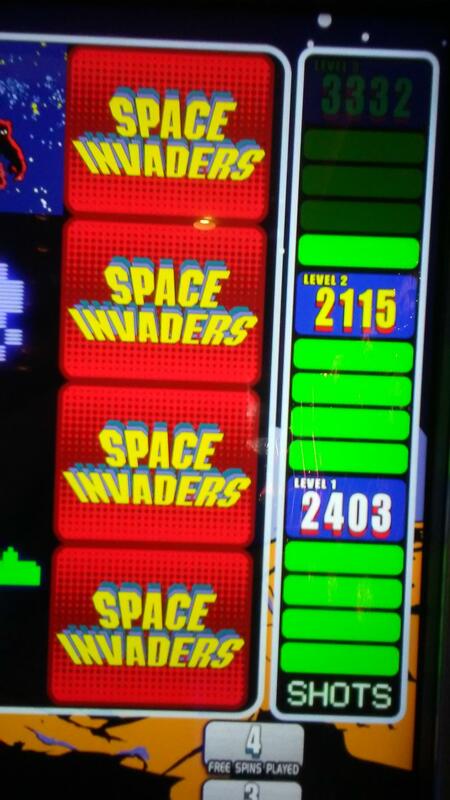 Space Invaders definitely has some AP opportunities, some more lucrative than others. This is a game receiving a lot of installs and its big and flashy so keeping the game a secret probably isn't gonna happen. That said, those AP's with the skills to figure out the angles will and those that don't have the skill will not have much success. There are varying AP angles here and some quite complicated to run. None of those will be discussed in this review which will stick to the basics of game play. The game comes in a flashy bright cabinet with a lower playing screen and a duplicated one above for the masses to watch. If millennials are the target audience this game is a failure based on my observations. However I saw the game receive quite a lot of attention from middle-aged to senior citizens. Most of the middle-aged people I saw were quite good at playing the arcade portion of the game. Of course, these people most likely played the game in their local arcades when they were teenagers. And that might be why millennials are not interested. You can't just put a video game out there and expect millennials to play it. 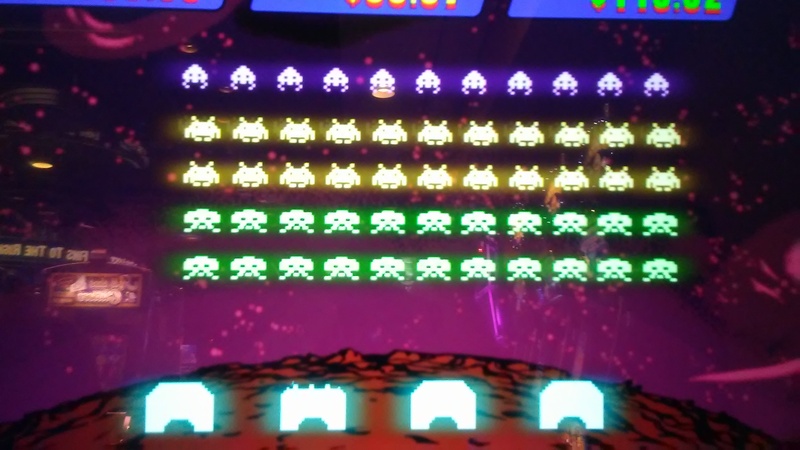 What most millennials see when looking at Space Invaders is their grandfathers videogame. The game consists of a base game which is a traditional slot machine although the game grid is a bit unconventional consisting of 4 high/6 across for 24 symbols. 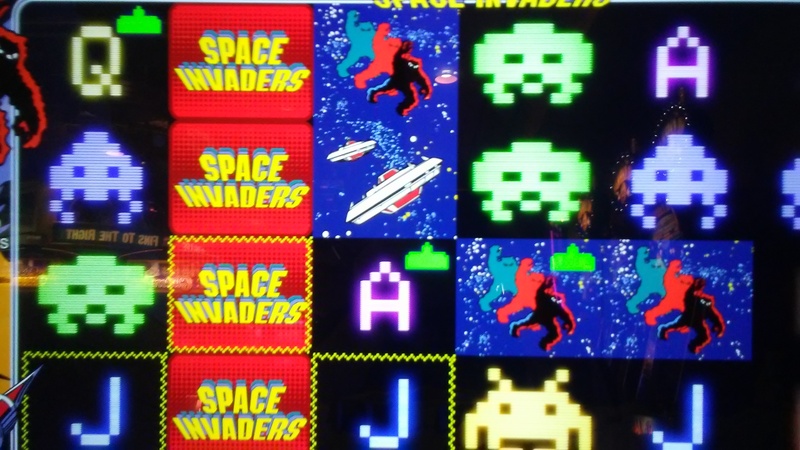 The images onscreen are bright red, blue and green flashy images. Bets range from $.50 to $2.50. Make your choice on a touch-screen angled towards you separate from the game screen. 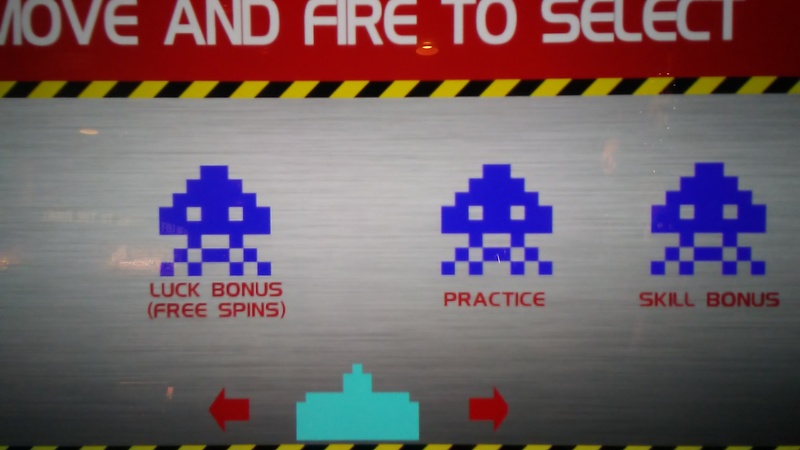 This same screen will double as your game controls in the Space Invaders bonus. As you play, green laser "shots" appear randomly above symbols. You collect these shots as you play the base game. Fifty shots collected gets you into the skill-based bonus round. Many people who sat down seemed unable to grasp this aspect. One person complained to me that they needed to explain this instead of letting everyone figure it out on their own. Of course, this was said while he completely refused to read the ever-present instructions right on the game screen. I don't know what more the company can do if people refuse to read! Have a live host at every install??? 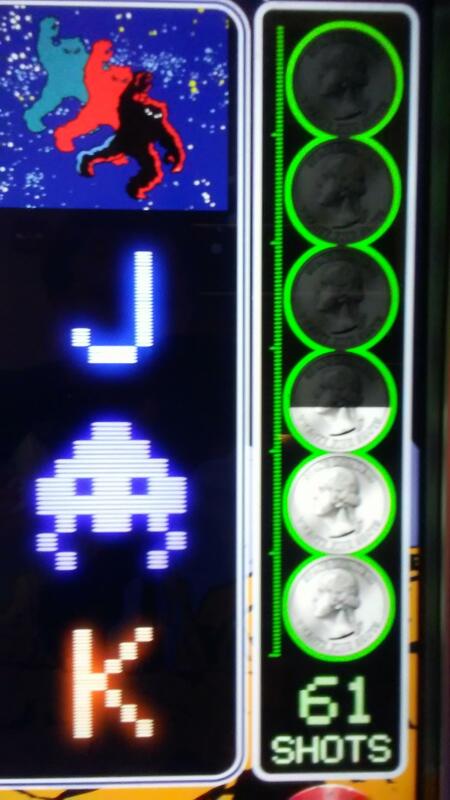 The shots are collected in a shot bank which has a quarter-dollar motif in keeping with the video game aspect of the slot. Here is a spin with three shots awarded. At minimum wager, these rarely appear however at maximum wager they are frequent enough. Anywhere from zero-6 shots per spin with an average of 1-3 can be expected. There are three plateaus to reach involving the shot bank. 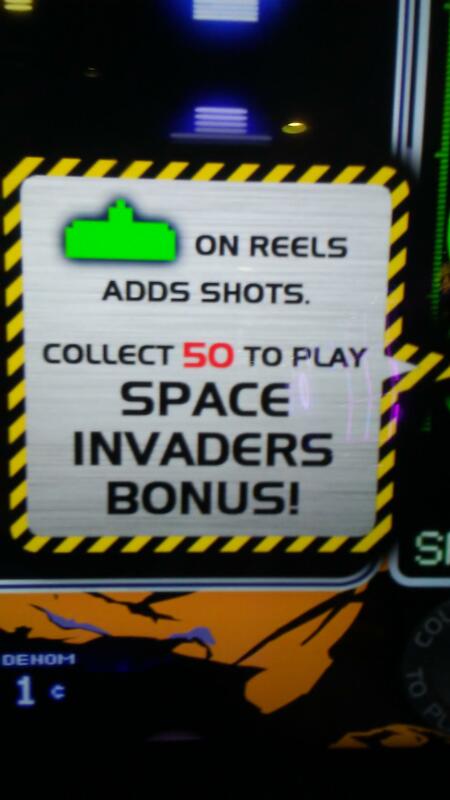 Once there are 50 shots in the shot bank you can opt to play the skill-based Space Invaders game. You will only have 50 shots with which to kill aliens. You may also opt to return to the base slot game to earn more shots. 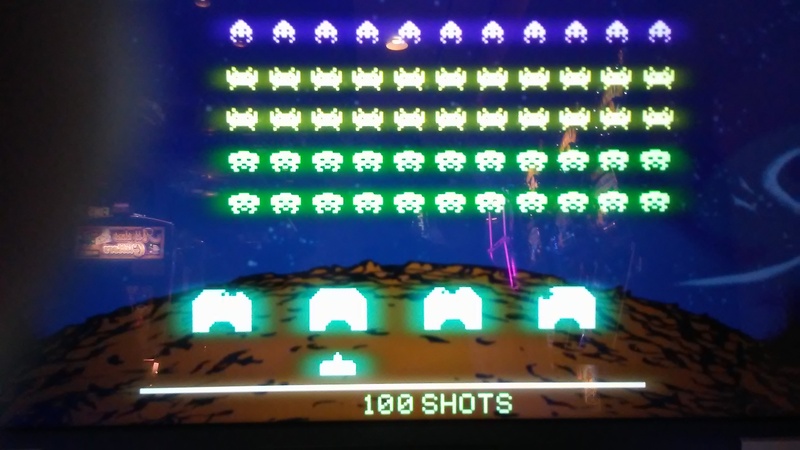 Once there are 100 shots in the shot bank you can opt to play the skill-based Space Invaders game OR you can opt to play an RNG luck-style slot bonus which consists of 5 free spins. You may also opt to return to the base slot game to earn even more shots. *NOTE* You may opt into the skill based round anywhere between 50-100 shots, however the overage remains in the shot bank. ex. If you have 79 shots you can opt to play Space Invaders with 50 shots leaving the remaining 29 shots earned in the shot bank. You are that much closer to earning 50 shots again once the bonus is concluded. This is a must hit bonus round plateau. 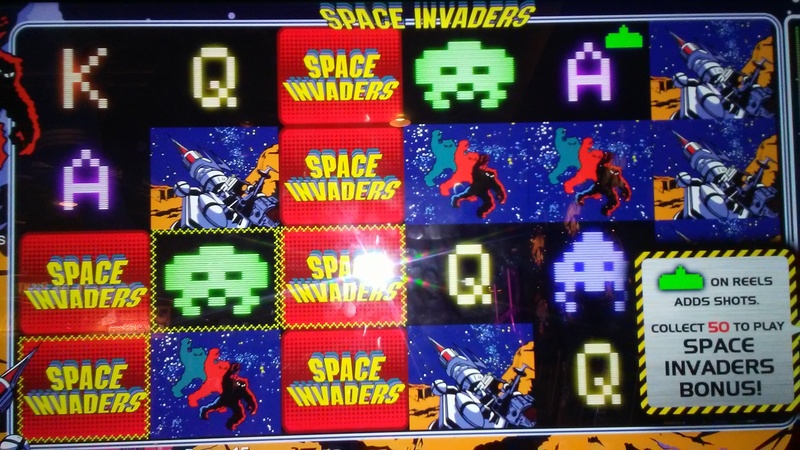 You can opt to play Space Invaders with 150 shots or play a traditional slot machine with 7 free spins. You cannot go back to the base game without playing the bonus. *NOTE* You may opt to play either the skill or luck game anytime between plateaus two and three however the bonus will play per plateau level 2. Ex. if you have 129 shots in the bank, you may only play Space Invaders with 100 shots and the balance of 29 shots will remain in the bank. Likewise, playing the luck game will give you only 5 spins instead of 7 and leaves the remaining 29 shots in the bank. 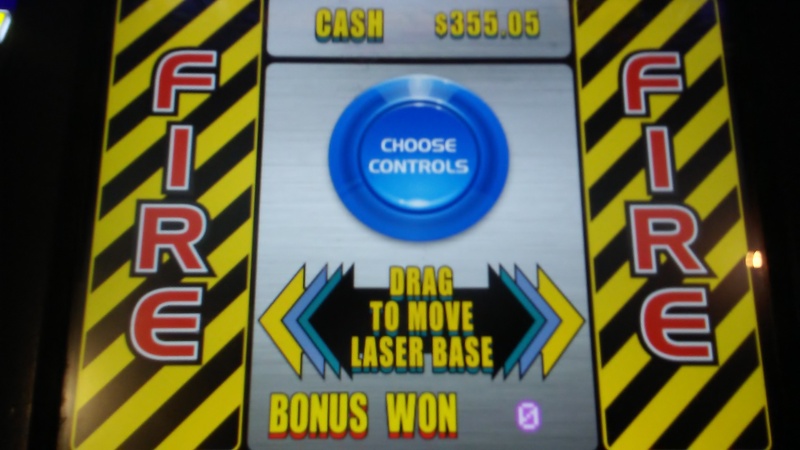 While playing the base slot game, 3 progressive meters are rising every spin. These start at $25, $50 and $100. They relate to the awards you can get by completing the three levels of the bonus round. They are a little bit complicated to understand so I will cover them momentarily. 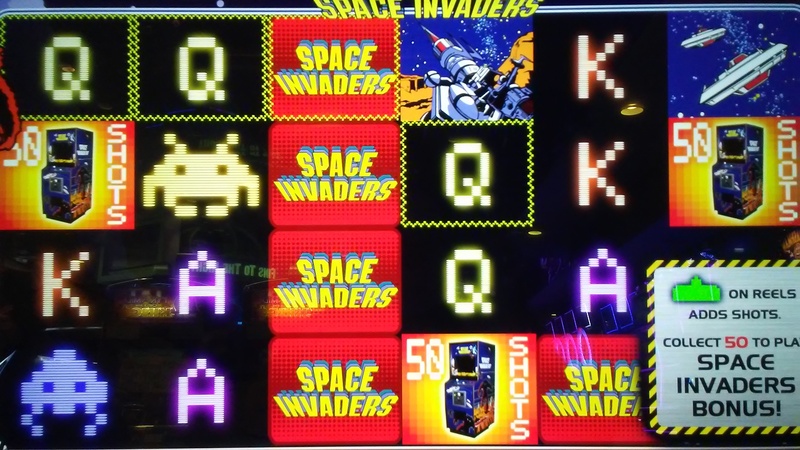 If u just want to play Space Invaders and forgo having to earn your way there via playing the luck-based slot you can simply pay $20 to go straight to the videogame. I guess that's inflation since the original arcade only cost a quarter. When buying your bonus the screen tells you how much the jackpots are for in each level since you didn't earn them in the base slot game. Buying the bonus for $20 nominally gives you 100 shots. Where I feel they dropped the ball on this game is the controller. A joystick and fire button ala the original game would have been so cool and spontaneous for most people. Instead there is a touch-screen control which takes a bit of getting used to. 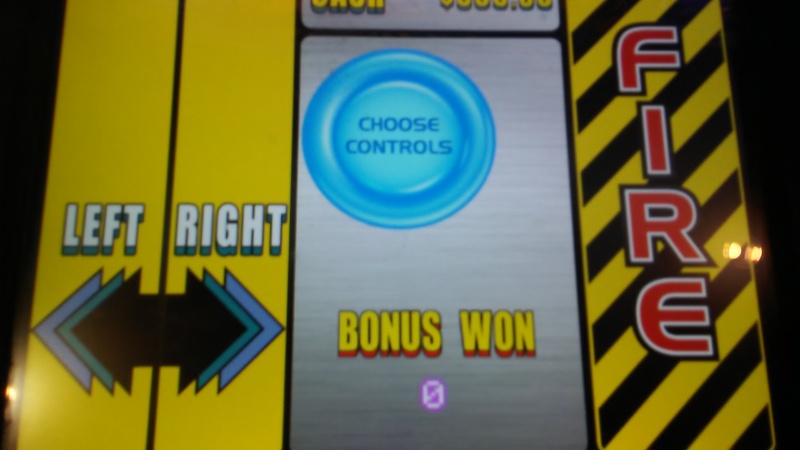 You have three options which you can toggle from a blue button when going into bonus mode. The reverse with Fire button right/lateral controls on left - all buttons needing to be pushed during play. Fire buttons on both left and right with a sliding left/right lateral movement in center. You drag your ships movement across screen instead of button mashing. 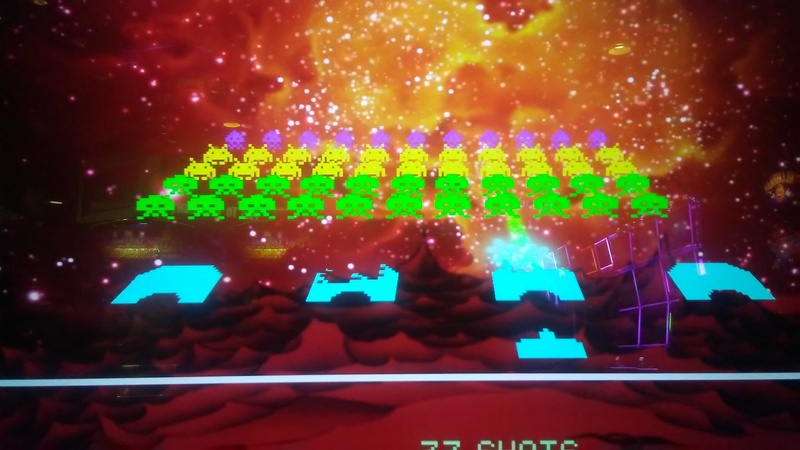 The skill bonus is traditional Space Invaders although you are only given one ship, not the ubiquitous three from the arcade machines so don't DIE! You must fight your way through three levels without being killed. 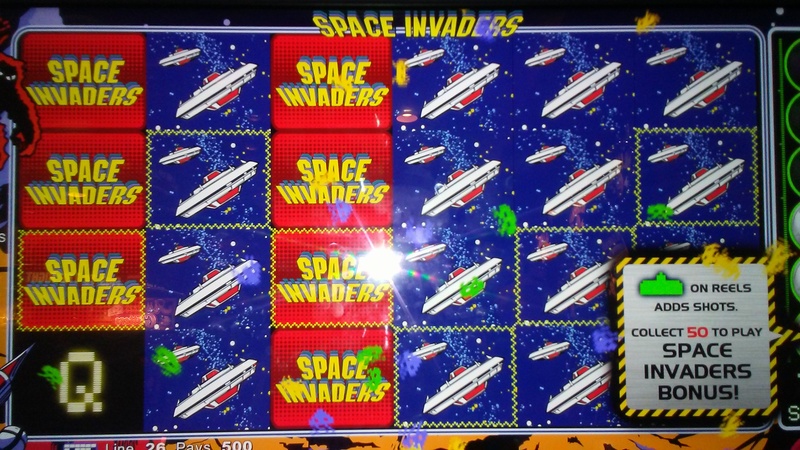 Shoot the mothership that flies across the screen periodically. This will award all the aliens from that level and advance you to the next level. It may also award you the progressive jackpot. Here is where an explanation of the progressives is needed to fully understand how it works. 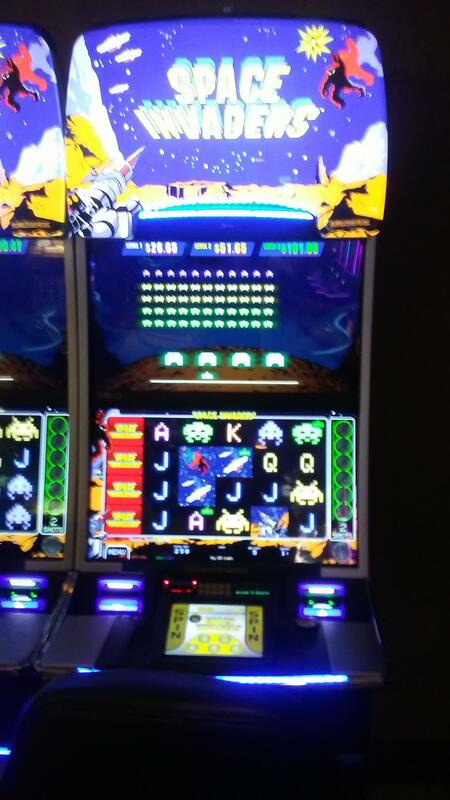 As you shoot each alien you get awarded credits WHICH simultaneously are deducted from the progressive meters. If you succeed in killing all the aliens in a level, the progressive meter would read the base level. Ex. in level one the meter starts at $25. 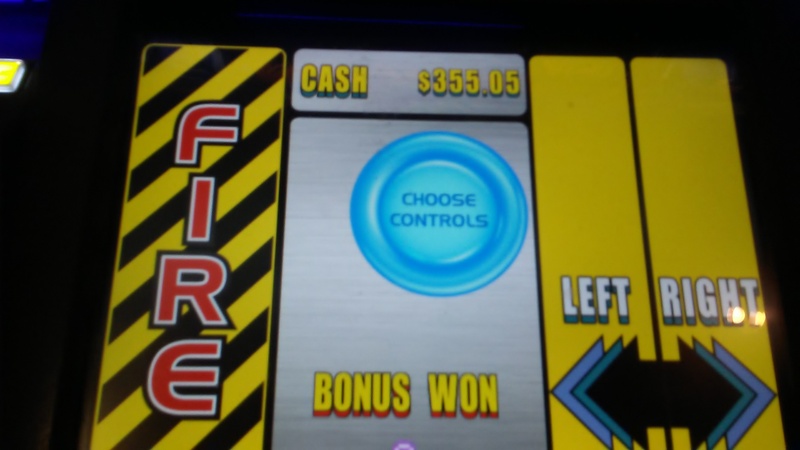 It goes up as you play the slot base game. Lets say it has risen to $42 by the time you play the skill game. 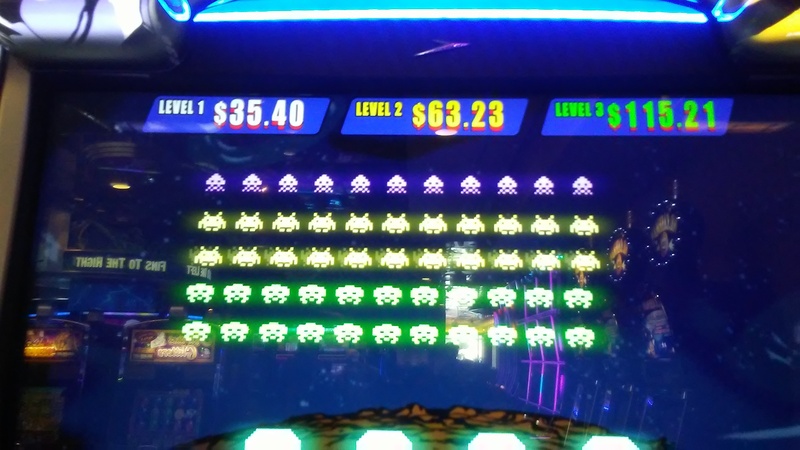 As you kill aliens the credits awarded are deducted from the progressive until all the aliens are killed and the progressive amount is $25 again. You do not win the full progressive amount seen onscreen by completing the bonus level. In essence, you are simply receiving a fractional rebate of the money collected by the machine while playing the base slot. This one is harder. The aliens are really gunning for you and their lasers are thicker so watch out. Level three is really hard. The screen actually morphs to an infinity plane(if that's the proper description). Think of the lettering at the beginning of every Star Wars film and how it goes off into the distance of outer space at a horizon-plane angle. That's how the aliens walk across the screen in level three. Even your lasers are shooting at this angle. Its difficult but I have witnessed a few skilled players beat this level. Once all levels are complete, then the game is over. You get the same animation as a win of over 40 times your wager, i.e, $2.50 gets you over $100 win. Its a pretty cool animation. For those people skill-clueless, you can opt to play the luck game instead as your bonus round - a traditional slot. Here you have 5 or 7 spins based on how many shots you earned. During free spins you can earn shots which go to a completely separate bonus shot bank. This bank is composed of only 15 shots to earn. You can earn more than 15 shots but those shots from the bonus are wasted. Every five shots earned gets you one of the 3 bonus amounts in the free spins bonus. The amounts seem to come out of nowhere but they are actually directly linked to the fractional rebate earned playing the base game. They are the amounts minus the base progressive meters. So the level one amount is what you would win if you killed all the aliens in the level one skill game, etc. 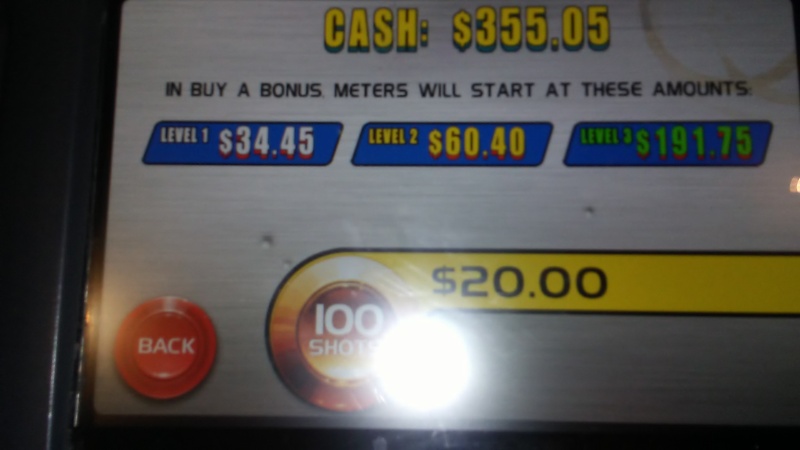 The progressive meters do go up if a level win is not attained so the fractional rebate of prior players is not lost or wasted. Since you don't have a mother ship to kill, you forfeit winning the progressive base meter amount by killing the mother ship (randomly awarded) however it is made up by the RNG amounts you can win with symbol combinations in each spin. One seemingly difficult thing to understand for a lot of people I witnessed was the cash-out. It is a two-step cash-out process. After hitting a physical cash-out button on the machine, you have to then hit a second cash-out on the game screen. This is done so you can be warned you are abandoning shots left behind in the shot bank and if eligible that you have a bonus round available immediately. This seemed to confuse a lot of people who hit cash-out and then assumed a malfunction when the ticket failed to appear. Their eyes almost never went up to the game screen but were glued to the ticket printer. Perhaps in future iterations there can be some adjustment or accommodation. This is a huge improvement in Skill-based gaming. A lot of people are giving it a chance even if they don't fully grasp how to play. Players who have skill can skip straight to the videogame. Players without skill can play it like a traditional slot. Players who like both can earn their way to the skill game. Skilled players are basically taking a fractional rebate from the losses of other unskilled players while the casinos continue to obtain their expected return. Offering skill based slot gaming is -EV for vegas when im in town. Ive won so much money off beating games online with high scores to get prizes such as java games as well as actual video games. Bad timing for vegas to introduce skill based gaming. Unfortunatly for you, this is not just some game you practice at, get good at, and beat other players. Knowing when to play, then finding plus EV situations all while dealing with competition getting there first will be the key. I've seen this game as I walk by. some ploppy is playing and gets 1/2 way thru the quarters. then he quits, and it goes back to like 10 shots (1/10th of a quarter). this part I don't understand. Do you have any contacts with Ainsworth? They've got the Pac-man license right now but have been noncommittal to this point about a skill-based casino version. WMS (pre-merger with Bally and SG) actually looked into a Pac-man slot with skill-based bonus a few years ago. They sent out a survey that had some concept images. The proposed control scheme was atrocious though -- and if it had actually made it to the casino floor it probably would've been yanked in under 2 weeks. Back on topic though... you should probably specify in what U.S. state you saw Space Invaders and took photos. Just because the machines all look the same does not necessarily mean that they will function identically in all jurisdictions (looking at you, Megabucks and Wheel of Fortune). those AP's with the skills to figure out the angles will and those that don't have the skill will not have much success. There are varying AP angles here and some quite complicated to run. I'm not sure how we should comment on your review since we're not supposed to discuss strategy, but the game itself (in Nevada) has an entire page of strategy recommendations, although I find them somewhat incomprehensible and/or counterintuitive. My impression is that most players will achieve better results opting for the free spins bonus. Apparently when a bonus round is available, a practice session is offered, which should be accepted since it's free. The quarters go up to 150, so halfway through the stack would be sufficient for a 50-shot bonus round. Did the player cash out or run out of credits? It would be unusual to run the credits down exactly to zero because bet amounts are only in increments of 50. It may be a game setup option the operator can turn on. 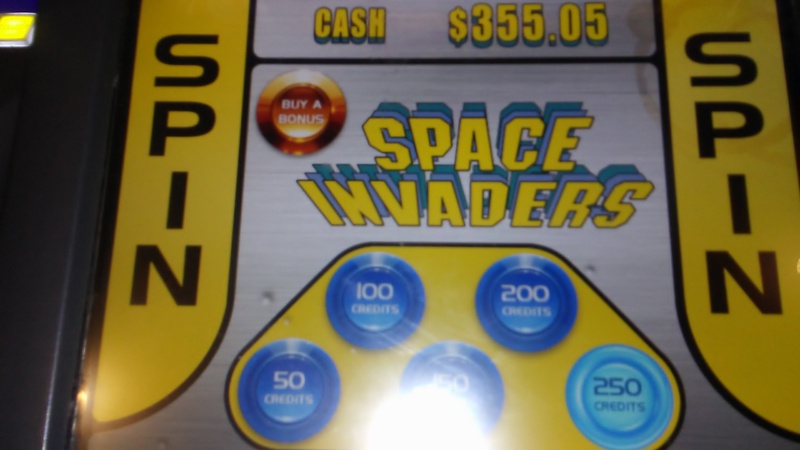 I programmed a game about five years ago that had an accumulator bonus similar to Space Invaders that had that option. When the player cashed out the accumulator went back to reset but the coins were placed in a hidden bank and would eventually be spread out to future bonus winners. I made sure that the hidden bank was not just awarded to the next player to win the bonus because that would still encourage vulturing. Instead, the next five to ten players hitting the bonus would reap the rewards. When the player cashed out the accumulator went back to reset but the coins were placed in a hidden bank and would eventually be spread out to future bonus winners. I made sure that the hidden bank was not just awarded to the next player to win the bonus because that would still encourage vulturing. Instead, the next five to ten players hitting the bonus would reap the rewards.